Skydive is included with this release as a Technology Preview. For more information on the support scope for features marked as technology previews, see https://access.redhat.com/solutions/21101. A typical software-defined networking (SDN) deployment can grow to significant complexity, as the layers of abstraction and virtualization make network analysis and troubleshooting seem more difficult. This complexity can be apparent in a cloud product such as OpenStack, where it can be a challenge to track the flow of traffic, or distinguish between the various types of bridged and tunneled networks that connect instances. To help with these challenges, Skydive is a lightweight distributed service that allows you view and debug your SDN deployment, allowing for easier network analysis and troubleshooting. 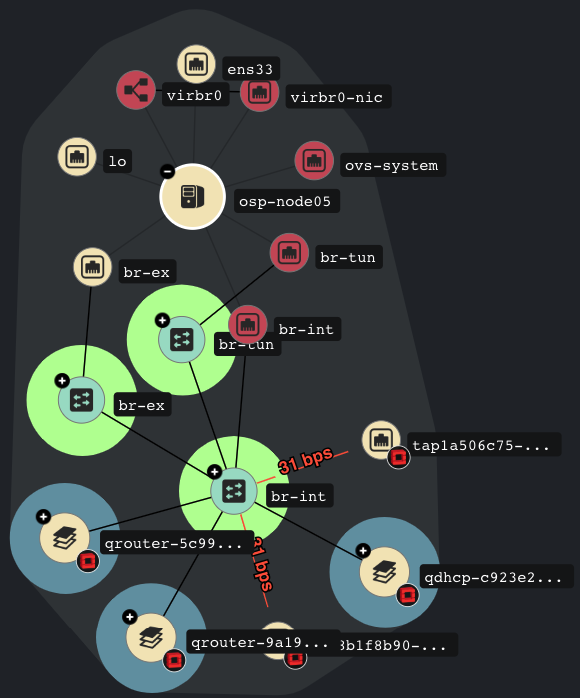 Skydive includes a web UI that displays a live view of your network topology, dependencies, and flows. The Skydive CLI allows you to generate reports and perform configuration audits. Skydive also includes a REST API; for more information, see http://skydive.network/documentation/api. Skydive is intended for use by cloud administrators only, and is not intended as a service for end-users or individual tenants. Check that your deployment is working correctly. Review whether the expected MTU settings are correctly applied. Generate traffic reports for a particular tenant. Capture network traffic between virtual interfaces. Alarming - for example: when an interface drops, or if a flow reaches a certain percentage of utilization. Identify low-latency nodes to host certain services. Skydive is a distributed service that relies on agents installed on each node. As demonstrated in the following diagram, these agents send data back to the analyzer services. The analyzer service reviews the data, generates reports, and present the results using an API. These reports can then be viewed using the web UI or through the command line reporting tool. Skydive is installed using Red Hat OpenStack Platform director, and is available as two composable services. For more information, see Chapter 2, Install Skydive. OVSDB - Open vSwitch (OVS) components. This information includes the OVSDB, bridges, ports, and interfaces. Netlink - A node’s network objects. This information includes the host’s interfaces, network namespaces, bridges, MTU, among others. 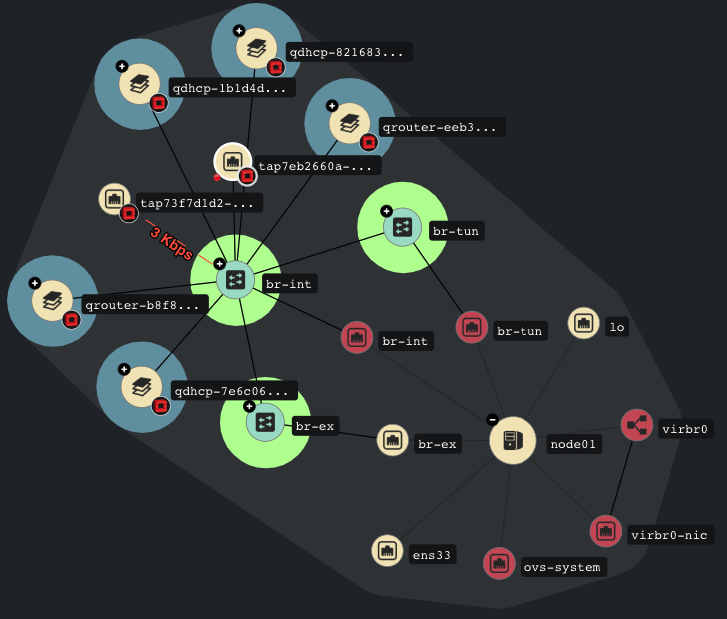 neutron - The OpenStack networking service. Custom objects - You can add your own static network components, such as a top-of-rack (ToR) switch. Install Skydive by adding skydive-environment.yaml to your openstack overcloud deploy command. The director installs SkydiveAgent on each Controller and Compute node by default. 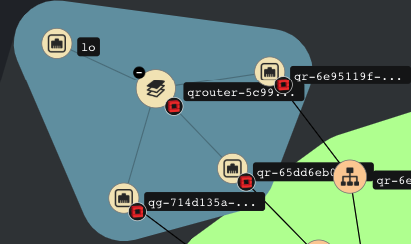 These agents report the network analytics back to SkydiveAnalyzer, running on the Controller node. Use the Skydive UI to perform a number of tasks, such as viewing your network topology. By default, you access the UI through a web browser on port 8082. For example: https://192.168.123.141:8082. Blue: The network namespaces created for the OpenStack projects. Red: Indicates that the network interface is down. $ /opt/stack/go/bin/skydive client query "G.V().Has('MTU', NE(1500)).Values('IPV4')"
$ /opt/stack/go/bin/skydive client query "G.V().Has('MTU',1500).Values('IPV4")"
Skydive Rest API, see http://skydive.network/documentation/api-rest. Use Skydive to capture the network statistics of an instance’s interface. This is useful for troubleshooting and diagnostics, or determining whether the network works as expected. To do this, first create a capture between the two interfaces, then use the Flows tool to query the captured traffic. In the Skydive UI, click Capture in the right-hand pane and click Create. Edit the IP address or instance ID to suit your deployment. Click Start to begin the capture.